I have no idea how to pronounce this band's name. In fact, it's been written a lot of different ways: TacacaT, Tacoca T, Tacocat. I read it as Taco-Cat and now I love it so much, I don't want to look it up and be proven wrong. This Seattle-based punk foursome provided the perfect jolt of adrenaline, kicking off Bumbershoot with fun songs that seemed to be mostly under 90 seconds and filled with pogo-jumping, air-punching abandon. Their material comes with titles like "Psychic Death Cat," covers subject matter from Tonya Harding to toxic shock syndrome, and they promise "every song is a true story." Plus, the band had a bubble machine. 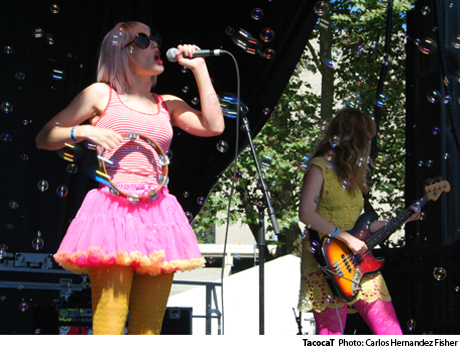 To summarize: TacocaT are awesome.